The debate over screen vs. glass enclosures is very confusing to novice keepers. Many petstores and a select few keepers often recommend glass enclosures and those not familiar with basic chameleon husbandry often take this advice as it is typical of most other reptiles. The fact of the matter is, it isn’t as simple as it sounds. Since chameleons are arboreal, tall cages are required but that sill have large ground area. It is often difficult to find reasonably priced glass enclosures with adequate dimensions. Screen enclosures, however, can be made tall for a very reasonable price. Similarly, large enclosures are extremely expensive in glass and are much more reasonable in screen. Chameleons require more ventilation than a lot of other herps. Most glass enclosures have minimal ventilation and that which they do have, is generally not adequate. It is very important to avoid air stagnation as chameleons are prone to respiratory illnesses which can quickly manifest themselves in glass enclosures due to the high humidity and water buildup at the bottom of the tank due to hydration needs. Brookesiinae, however, are often kept in glass terrariums quite effectively. For smaller chameleon species, however, glass terrariums can be utilized. These enclosures are specially designed to maximize airflow with ventilation in the front below the doors and screen tops. These enclosures create a chimney effect resulting in airflow throughout the enclosure that aquariums are not able to produce. Care should be taken in these enclosures, however, to ensure that the enclosure dries out between misting to avoid respiratory and skin infections. Chameleons, like other reptiles, require a basking spot to warm themselves. At the same time, they need to be able to escape the heat of a basking area to a more moderate ambient temp. Furthermore, they require UVB rays for metabolic functions. It is important, however, not to over expose them to UV rays. At the same time, they should be able to have access to UV and heat without being forced exposure to the other. As a result, gradients are of critical importance in chameleon cage construction (See article Gradients in Cage Design). A separate basking bulb and UVB bulb should be provided. Baskin bulb wattage should vary depending on ambient temperature conditions and the species so that a sufficiently warm basking spot is provided yet the ambient temperature of the enclosure is not excessively high. Choosing a UVB bulb should be based on the size of the enclosure. High intensity, long distance output UV bulbs like MV (Mecury Vapor) bulbs should be avoided except in large enclosures where UV rays have the needed distance to dissipate and provide a gradient. In smaller enclosures, florescent tubes like the Reptisun 5.0 are recommended as their intensity and radiation distance are significantly decreased. (See article Lighting for Chameleons). Ceramic heat bulbs are generally not recommended as chameleons are not typically attracted to non lighted heat sources. Heat rocks are absolutely not recommended as they are known to frequently burn reptiles and are of little use to an arboreal animal. Night lights are typically not recommended with chameleons as they tend to benefit from a temperature drop at night. If temperatures get too cold however, a ceramic heat bulb or red bulb can be used to increase the temperature slightly. Since chameleons are arboreal, shy, tree dwellers, it is very important to provide arboreal refuges that they can hide in and feel secure. They do not seek out hide boxes like many other reptiles. They require well planted enclosures where they can hide amongst and behind foliage. While some use fake plants, live plants are generally much preferred by experienced breeders and the animals themselves. One benefit to live plants is that they help increase and maintain humidity in the enclosure. One should use caution to only use nontoxic species however as many chameleon species are known to eat some leaf matter and in other cases, insects in the enclosure can chew on the plants. For information on common chameleon plants and their care, see the article Introduction to Common Chameleon Plants for Beginners. In addition to live plants, a series of horizontal and diagonal branches of varying diameters should be provided throughout the enclosure for the chameleon to travel on. These branches should be secured to prevent falling. Varying the diameter ensures that the chameleon’s feet are exposed to varying foot use. With the exception of Brookesiinae, chameleons generally do not need a substrate in their enclosures. Substrates can increase pathogen levels, increase the danger of impaction and make maintenance difficult. Paper towels, newspaper or bare care bottoms are preferred and should be cleaned regularly. Drainage considerations are important when constructing enclosures. 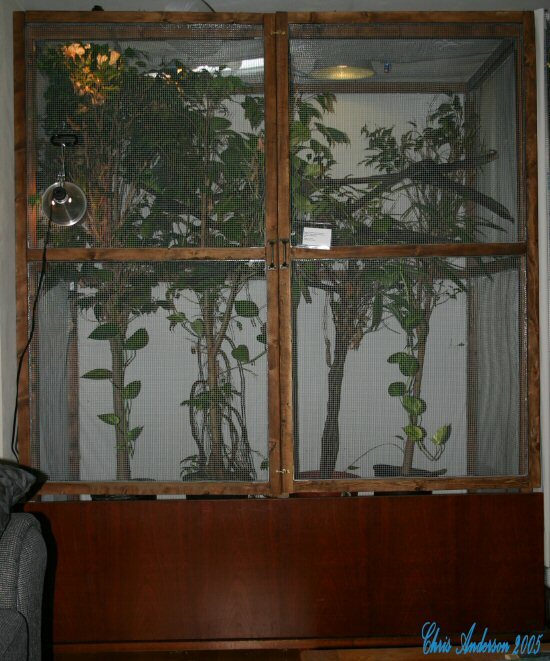 An example of a large chameleon enclosure. As previously mentioned, Brookesiinae can be kept in glass enclosures quite easily. For information on the construction of suitable tanks, read the following article: Constructing a Stump-Tailed Chameleon Habitat.